Mix together everything but the steak in an air tight container. Add the steak, put the lid on and shake it to coat. 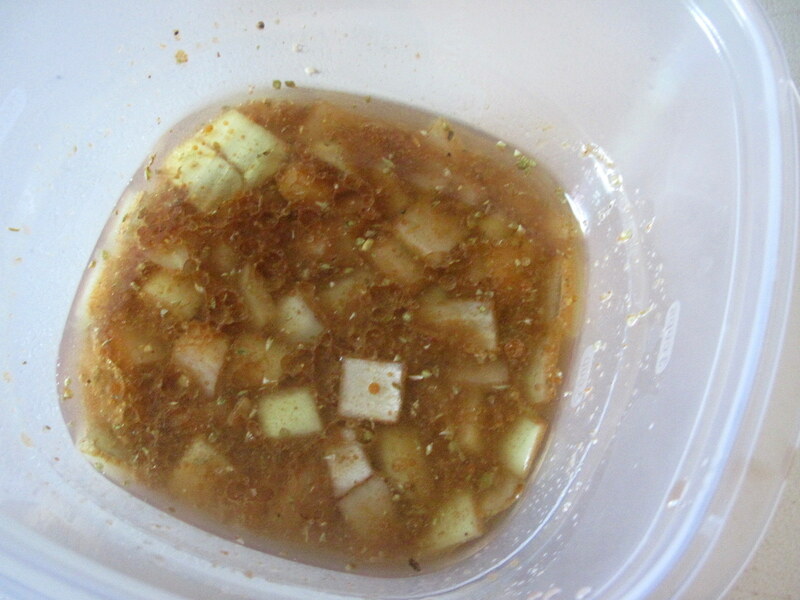 Let marinade for at least an hour, overnight is best. Grill or broil until it’s done how you like it, serve sliced thin. This is a quickie, mostly because other than “it’s easy” and “it’s wicked awesome” there isn’t so much to say about this. It’s just so easy and awesome. Coriander is my new favorite thing and this marinade really highlights it’s flavor which I’ve found often gets kind of hidden in other spices. 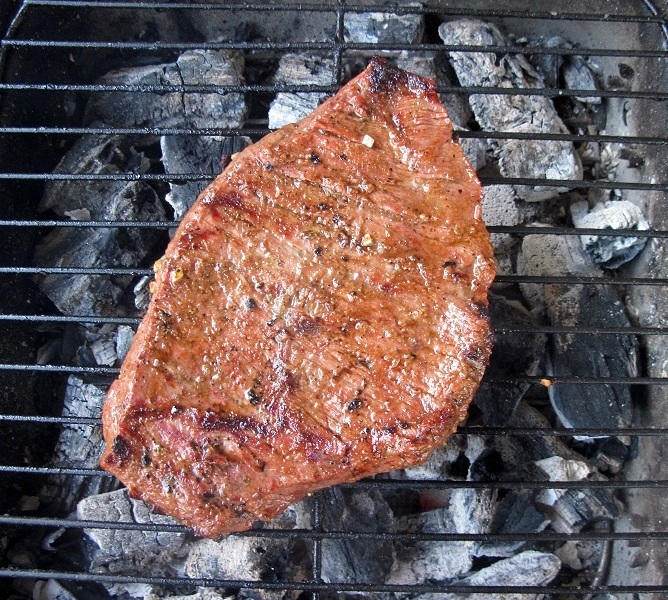 You could broil this and have it be wicked good, but the grill is really where it’s at. Plus now that I have a grill I pretty much want to use it all the time. Heh. I ate this (I was going to say “I served this” but I didn’t, I’m the only one who ate it this time) with some flatbread and a yogurt sauce. Heaven. 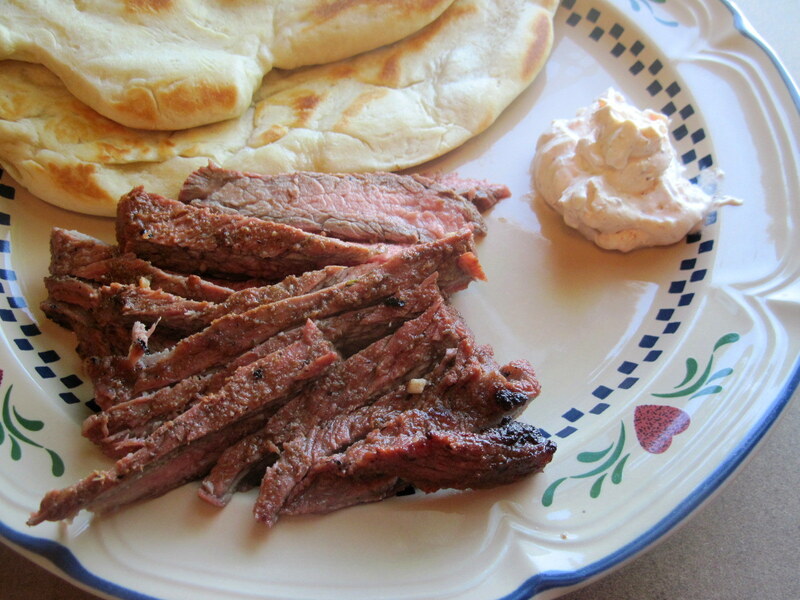 You could have it with tzatziki, of course, but this was just a quick one I made with garlic and red wine vinegar. It was just lovely. The flatbread was different that usual too, I used some sour cream in it and it came out tasty too. I’ll have to post a recipe for that another time, but right now the couch beckons and who am I to say no? Heh. Will add this to my list to try when I get back from California. I love coriander! And cumin. And the two together. Really tasty looking steak – thanks. Unless otherwise noted I have not been payed, given freebies or in any other way bribed by any company, website, store, individual or nonprofit organization for a review or any kind of mention. I am however open to it.